Not too long ago, netbooks were the next big computing trend…for about five minutes. Then tablets came along and everyone forgot all about the weirdly-sized, low-powered mini notebooks. If you’ve still got a netbook lying around that isn’t being used, Popular Science has the very best idea for making it useful again. 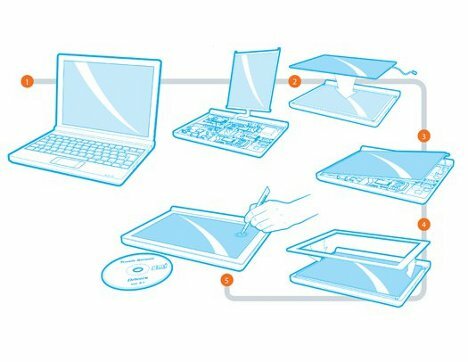 Following their few simple steps, you can turn that old netbook into a spiffy new tablet computer. It’ll cost you around $100 and you have to have some technical skills, but if you’ve got the cash and the know-how it only takes about a day to complete the transformation. According to the instructions, you’ll need to procure a touchscreen overlay, which will run around $80, and a silicone clay known as Sugru. After a bit of disassembling and reassembling, installing a driver, calibrating the screen and reveling in your awesome tech skills, you’ll have a custom tablet for way less than an iPad would have cost you. It probably won’t look nearly as slick, but what it lacks in style it will make up in bragging rights.